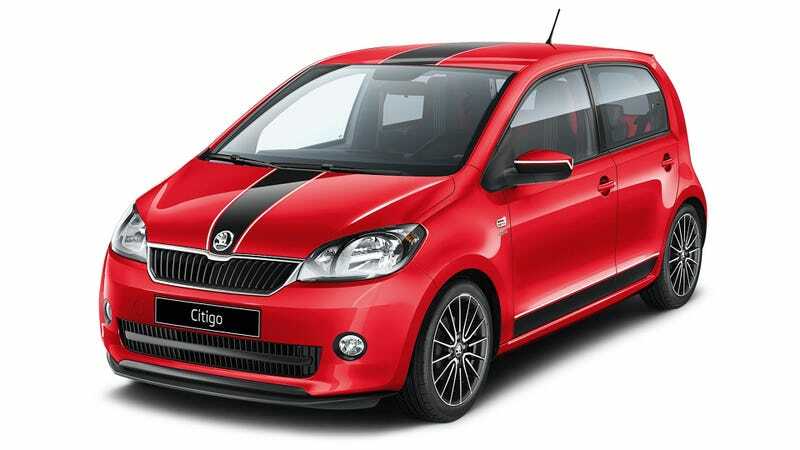 Volkswagen AG's cheapest minicar got some steroids for the Geneva Motor Show, but since the engine remained the standard 1-liter unit with 60 horsepower, even Skoda refers to the Citigo Sport as a car that is "seemingly powerful." The Czechs are remarkably honest. Available with both the 3-door or the 5-door bodies, the Sport can be ordered in only three colors: Candy White, Tornado Red or Deep Black, all with contrasting stripes. 15-inch black alloys, fog lights, tinted windows, front and rear spoilers and a rear diffusor tries to make it up to you for the lack of power, while the sports suspension lowers the ride height by 0.59 inches. Inside, the black and red sports seats and a two-tone grey and black dashboard should make you feel special, and the five-inch touch-screen comes standard with satellite navigation, Bluetooth and as much connectivity as you would expect. The three-spoke steering wheel, the handbrake and the gearstick are all wrapped in leather with contrasting red stitching, naturally. Still sounds slow, but fun nevertheless.